Restorative practices is a field of study that has the potential to positively influence human behavior and strengthen civil society around the world. Restorative practices builds healthy communities, increases social capital, reduces the impact of crime, decreases antisocial behavior, repairs harm and restores relationships. The talking piece is extremely important for restorative practices. The talking piece is an object identified at the beginning of the circle. This Circle is a space where only one-person can speak at a time. The person holding the talking piece is the only person who can speak. The use of a talking piece allows for full expression of emotions, deeper listening, and thoughtful reflection without feeling rushed or fearing interruption. The talking piece allows people who generally do not speak up to engage but also allows any person the option to pass on speaking. The talking piece is always passed to the left and moves around the Circle. This is important especially in conflict resolution Circles because we do not want those in conflict to talk back and forth with each other. The time spent passing the talking piece around allows for some reflection time between things said by the grieving parties. Also, sometimes members of the community can make observations or bring new perspectives to the discussion. This practice is also conducive to the learning in our class because it requires students to process their own their ideas instead of just reacting. In this case, Walden Anderson’s talking piece is this bible. His mother gave it just before he decided to turn himself in to authorities; it took 25 years to return from that long walk to the precinct. Throughout his horrifying yet transformational journey he has kept this bible with him. When he thought all hope was gone, he looked to that bible and its symbolism of the hope and strength his mother had when she gave it to him and found the will to move on. However, when he returned his mother had passed on. Like his mother’s spirit, the bible stays with him. 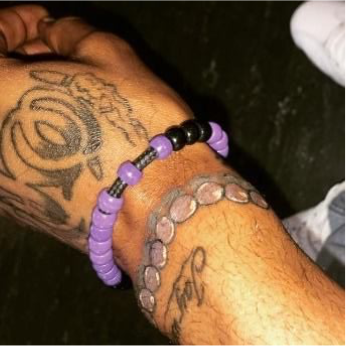 Tyree Hicks wears purple beads on his wrists as a significant reminder of why he is dedicated to helping under resourced youth by guiding them away from violence and the criminal justice system. Tyree’s cousin and best friend, Teflon, died right in front of him. Gunned down by a rival gang member, Teflon still had the presence of mind to try and direct his friend away from the violence that took his own life. Teflon took off his ever loving purple beads and told Tyree that he has to find another way as he handed them to Tyree. Now, Tyree wears the actual beads, but he also has the image tattooed on his wrist. So when he uses the beads as a talking piece, he still has them on his wrist by virtue of the tattoo. The guidelines of the Circle are commitments or promises that participants make to one another about how they will behave in the Circle. The purpose of guidelines is to ensure that every member of the Circle feels safe to talk openly and honestly without fear. It is only when people feel safe that they can truly open-up and that vulnerability is vital and must be treated with great care and respect. It is in this openness that healing and understanding is realized and why restorative practices differ from western models of healing and connectedness. The guidelines are not imposed by the facilitator, rather the circle keeper ensures that there is consensus in the Circle about the community guidelines. The guidelines should come from what participants want to give, as well as what they want from others in the Circle. Through consensus these guidelines are for everyone to follow. This ensures that people are aware of everyone’s needs and encourages people who often have unmet needs the opportunity to make the Circle safe for their own development. ITM partners with Ramapo for Children for a trip outside New York City. Ramapo offer ropes courses and other physical experiences that participants work through while building communication skills, teamwork and problem solving. During the retreat, Credible Messengers develop strong bonds with each other, which is another critical aspect of successful pro-social peer mentoring spaces. Record breaking performances at Ramapo for Children for the Leaning Tower of Pisa exercise and the Traffic Jam challenge - critical thinking games. ITM students have shown exceptional problem-solving skills that they have gained from their life experiences.